NOT ALONE is the main prototype for my PhD work. 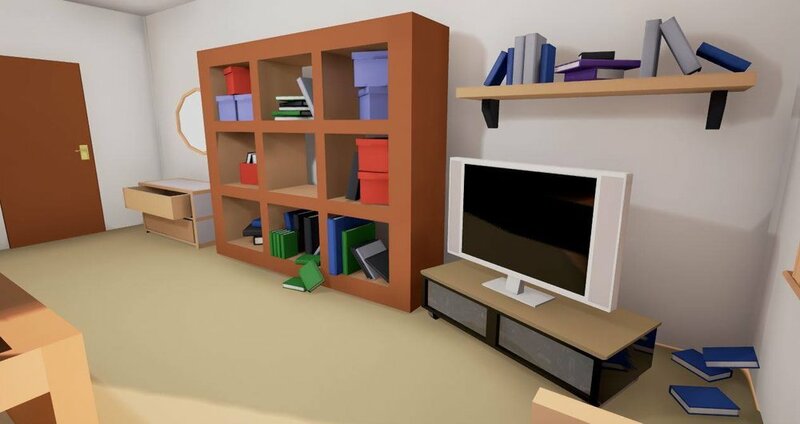 The game follows the stories of 4 fictional cancer patients and their journey through the British healthcare system. The fictional stories are informed by interviews conducted with current cancer patients, cancer survivors, their immediate families and healthcare professionals to ensure that all perspectives of the process are captured and conveyed in a sensitive and respectful manner. 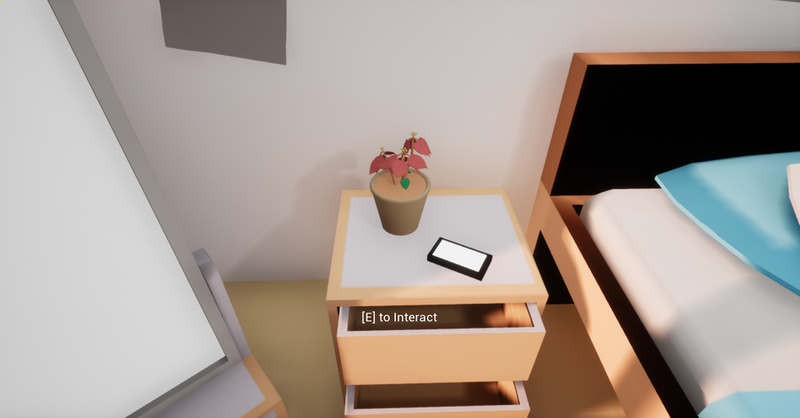 The prototype intends to alleviate feelings of isolation and loneliness in patients by providing them with shared experiences and perspective through relatable characters. It will also be a useful tool for patients, family members, healthcare professionals and the general public by providing different viewpoints, inviting them to adopt different personas and fostering empathy and understanding of their positions. Since graduating in 2015, the games engine software that I was using (UDK) had been updated to a new version (Unreal Engine 4). This provided my first challenge as I needed to gain an understanding of the software required to create my PhD prototypes. As my first exercise I wanted to develop a quick hospital room scene that would feature in NOT ALONE. At this stage I am not so bothered by the quality of the assets as I was using it more as an exercise to get used to the new development environment and lighting options. The scene above was my first foray into using the Unreal Engine 4 editor. After whiteboxing the ward scene, I decided that it would be a good idea to dust off my skills in Autodesk Maya. I was used to creating assets in the Autodesk Maya 2013 environment so installing working with Maya 2018 was my next challenge. Thankfully the software remained relatively similar but I found that a few tools that I used to use were now legacy content. Thankfully the replacement tools weren’t too difficult to locate and use. Above are some renders from the environment with my first-pass low-poly assets inserted. I am quite pleased with how the scene is beginning to shape up. In NOT ALONE I want to focus more on the personal aspects of the cancer journey rather than the clinical practice and process. I want to convey how appointments, tests, scans etc. can impact the daily routines and mental well-being of the patient. As such it is important to convey the typical lifestyle of the patient through home environments. 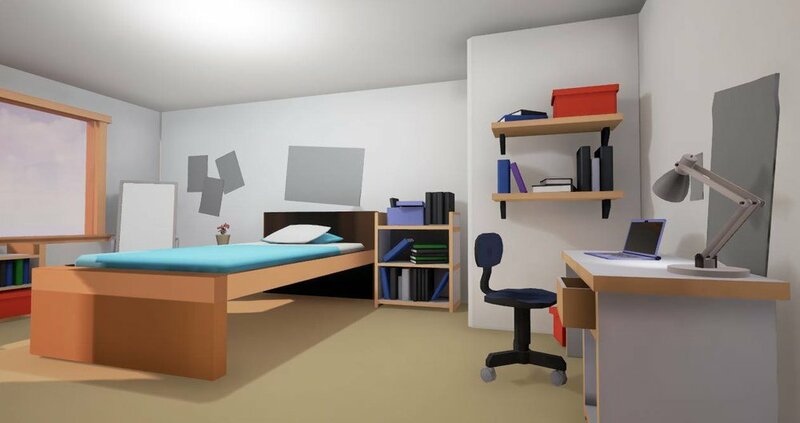 As such, I began creating the ‘teenage bedroom’ environment. Due to using gamed media to convey these stories, the most likely user of the product will be someone in their late teens to early adult years. This first story will focus on a late teenager/ early adult female with breast cancer. In my previous games I have never used additional characters to the player, only ever alluded to them through environmental storytelling techniques or using written textual prompts. For NOT ALONE there will be a strong focus on the other characters as they are integral to conveying the story. This provided its own set of challenges as I have only ever modeled a character once (and not a very good one at that! ), nor have I rigged or animated before. For the above prototype I modeled a basic low-poly female character, rigged her and exported multiple pose-sets. It was through creating this that I had my first experience with the visual scripting language “Blueprint”. I am extremely pleased with the outcome of this experiment as it conveys movement without the need for fluid animation. The placeholder audio used in this test was taken from online documentary DOCS: Teenage Cancer Ward available on YouTube.